c Overseas department; d "Territorial community". e Treaty of Paris (1814). f 0508 from metropolitan France or overseas départements. Saint-Pierre and Miquelon (French Saint-Pierre et Miquelon) 46°47′N 56°12′W is a French overseas community consisting of several small islands off the eastern coast of Canada near Newfoundland. It is the only remnant of the former colonial territory of New France. Miquelon and St. Pierre were settled very early by Europeans taking advantage of the rich fishing grounds, and characterized by periods of conflict between the French and English. The French fished near the islands for about 200 years. France and Britain fought and traded the islands back and forth for about 100 years, associated with various wars and the American and French Revolutions. France took the islands back after Napoleon abdicated and a fishing boom followed for a few decades. After the late 1800s, fishing went into decline. Alcohol smuggling boomed during U.S. Prohibition in the 1920s and 1930s. The islands were controlled by the Axis powers and then recaptured in World War II. Fishing continued to decline after the war so the islands are trying to diversify their economy. There is evidence of prehistoric native inhabitation on the islands. The European settlements on the islands are some of the oldest in the Americas, dating from at least the early 1500s. At first the Basque fishermen only visited the islands seasonally during the fishing season, and by the mid 1600s there were permanent French residents on the islands. At the end of the 1600s and into the early 1700s, British attacks on the islands lead to the French settlers abandoning the islands, and the British took possession for 50 years (from 1713 to 1763). The French took the islands back in 1763 and settlers returned to live peacefully for 15 years. Then the French support of the American Revolution lead a British attack on the islands, and the deportation of the French settlers. Possession of Miquelon and St. Pierre passed back and forth between France and Great Britain for the next 38 years, as the islands suffered attacks by both countries, voluntary or forced removal of the island's residents, and upheaval associated with the French Revolution. France finally took the islands back after Napoleon's second abdication in 1815, and there followed 70 years of peace and prosperity for the French fishing industry and residents on Miquelon and St. Pierre. However, political and economic changes lead to a slow decline of the fishing industry after the late 1800s. There was a short 13 year economic boom on the island associated with the period of Prohibition in the US, when Miquelon and St. Pierre were prominent bases for alcohol smuggling. This boom ended with the the end of prohibition in 1933, and the economy sank into depression. During the Second World War, the governor, Gilbert de Bournat, was loyal to the Vichy regime; he had to negotiate financial arrangements with US authorities to obtain loans guaranteed by the French treasure. At the same time, Canada was considering an invasion of Saint-Pierre and Miquelon. Several pretexts were put forward, notably radio broadcasts of the Vichy propaganda. It was alleged that the radio was helping German U-Boots on the Grand Banks, though this was never proven. Canadian Prime minister William Lyon Mackenzie King never authorised the implementation of the plans. Under orders of De Gaulle, admiral Émile Muselier organised the liberation of Saint-Pierre and Miquelon, without the consent and knowledge of the Canadian and US authorities. On the 24 December 1941, a Free French flotilla lead by the submarine cruiser Surcouf took control of the islands without resistance. De Gaulle had a referendum organised, which was favourable to him, and Saint-Pierre and Miquelon thus became one of the first French provinces to join Free France. The affair led to a durable distrust between De Gaulle and Roosevelt. The politics of Saint-Pierre and Miquelon take place within a framework of a parliamentary representative democratic French overseas collectivity, whereby the President of the General Council is the head of government, and of a pluriform multi-party system. Executive power is exercised by the government. In 1992, a maritime boundary dispute with Canada over the delineation of the Exclusive Economic Zone belonging to France was settled by the International Court of Arbitration. In the decision, France kept the 12 nautical mile (NM) (22.2 km) territorial sea surrounding the islands and was given an additional 12 NM (22.2 km) contiguous zone as well as a 10.5 NM (19.4 km) wide corridor stretching 200 NM (370 km) south. The total area in the award was 18% of what France had requested. The boundary dispute had been a flash point for Franco-Canadian relations. New claims made under UNCLOS by France over the continental shelf might cause new tensions between France and Canada. 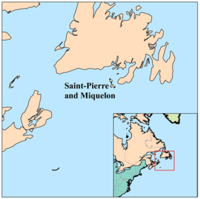 Saint-Pierre and Miquelon is administratively divided into two communes (municipalities). They are: Miquelon-Langlade and Saint-Pierre. The island of Saint-Pierre is surrounded by smaller dependencies which include the island of Grand Colombier, Petit Colombier, Île aux Marins (formally known as Île aux Chiens), Île aux Pigeons and Île aux Vainqueurs. The total area of the islands is 93.4 square miles (242 km²). They have a coastline which is 74.5 miles (120 km) long. The island of Miquelon is roughly 15.8 miles from the coast of Newfoundland at their closest points. However, there is a small island with a lighthouse belonging to Newfoundland called Green Island that is between Langlade and St. Pierre and Newfoundland at 46°53′N 56°05′W, about 10 kilometers from Langlade and St. Pierre. The island of Miquelon is separated from St. Pierre by a 6 kilometer strait with very fierce currents. Fishermen call this section of ocean "The Mouth of Hell". The waters around these islands are very treacherous, and there have been over 600 shipwrecks along the coasts of the islands. The island of Miquelon was formed by the joining of three islands by sand dunes and Quaternary deposits. 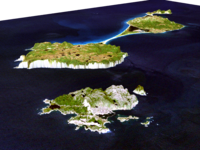 These islands are Le Cap, Miquelon (Grande Miquelon), and Langlade (Petite Miquelon). Miquelon and Langlade were separate until a large sandbar joined them in the 18th century. Miquelon has a lagoon called Grand Barachois, where seals and other wildlife can be found. The climate is very damp and windy, the winters are harsh and long. The spring and early summer are foggy and cool. Late summer and early fall are sunny. Every spring, whales migrating to Greenland are visible off the coasts of Miquelon and St. Pierre. Trilobite fossils have been found on Langlade. There were a number of stone pillars off the island coasts called "L'anse aux Soldats" that have been eroded away and disappeared in the 1970s. The islands were dependent upon the cod fishery for the best part of the last four centuries. However, overfishing on the Grand Banks has led Canada to impose a long-term closure of this industry. Since fishing quotas are governed by Canada, Saint-Pierre and Miquelon and the French fishing fleet (whether based out of the islands or out of mainland France) have been seriously affected. In Saint-Pierre and Miquelon many efforts are being made, with the help of the French government, to diversify the local economy. Tourism, fish farming, crab fishing and agriculture are being developed. Except for two coins issued in 1948, the islanders have used French currency, and now use the euro. Until the 1990s, the islanders used French postage stamps, but now the islands issue their own. Domestic French postal rates apply to mail between mainland France and the islands. The French postal code is 97500. The population of Saint-Pierre and Miquelon at the 1999 French census was 6,316 inhabitants. 5,618 of these lived in the commune (municipality) of Saint-Pierre and the other 698 in the commune of Miquelon-Langlade (697 on Miquelon proper, and 1 on Langlade Island). Langlade currently is unpopulated, since its sole inhabitant, Charles Lafitte, died in July 2006. Langlade is a summer retreat for many inhabitants of Saint-Pierre, when its population can swell up to 1000. French is the official language of the islands, but the accent and many of the words used are similar to the language of Normandy. French patriotism is strong on the islands, and the islanders are proud that some of the soil on the island is French, having been brought over in the ballasts of ships. Basque pride might be just as strong, given the strong historical ties of the islands to the Basque region of France. Every year in the summer there is a Basque Festival, with demonstrations of harrijasotzaile (stone heaving), haitzkolari (lumberjack skills), and paleta (a game somewhat like Jaï-Alaï). Hockey is very popular in Miquelon and St. Pierre. Several players from the islands have played on French teams and even participated on the French National hockey team in the Olympics. Defense is the responsibility of France. Saint-Pierre and Miquelon has no railway and 114 km of highways (plus 45 km of unpaved roads). Its only major harbour is Saint-Pierre. The dependency has no merchant marine and two airports, one with 1,524 to 2,437 m of paved runways and one with 914 and 1,523 m.
Regular ferry service is available between Saint-Pierre and the town of Fortune, Newfoundland. Saint-Pierre and Miquelon is in its own time zone, UTC-3, which means three hours behind Greenwich Mean Time. This also translates to two hours ahead of New York ( Eastern Time Zone), one hour ahead of Halifax ( Atlantic Time Zone), and thirty minutes ahead of St. John's ( Newfoundland Standard Time Zone). Denis Kang, martial arts fighter. Henry Hughes Hough, Rear Admiral in the United States Navy and Governor of the United States Virgin Islands. Léon Charles Albert Calmette, a member of the French Naval Medical Corps, was assigned to the islands after being stationed in Hong Kong, and arrived in 1887, in time to witness the guillotine execution. He studied the codfish, and realized that a bacterium was responsible for their colour. In later work, he collaborated with veterinarian Camille Guérin to produce the BCG vaccine against tuberculosis.